IPAC will partner with Goddard Space Flight Center and the Space Telescope Science Institute to provide the Science Center functions for WFIRST. This web site describes IPAC's current role in developing and curating telescope instrument and simulation efforts, as well as engaging the greater scientific community in preparing for the science of WFIRST. The CGI Exoplanet Imaging Data Challenge Hackathon at IPAC on June 24-25, 2019 is now open for registration. The Exoplanet Imaging Data Challenge is now open for preregistration. 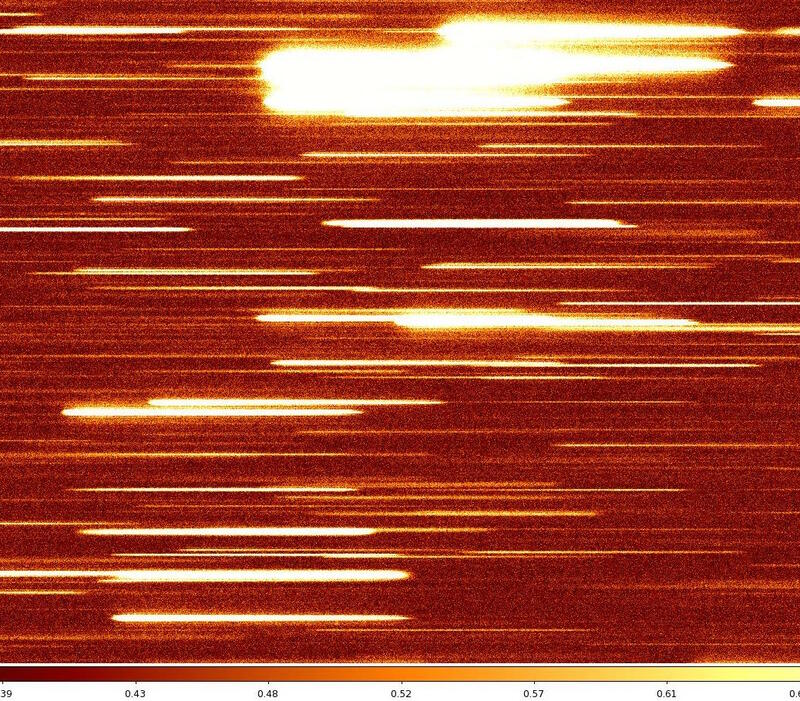 Results from the Microlensing Data Challenge are summarized here. Registration now open for Science in Our Own Backyard: Exploring the Galaxy and the Local Group with WFIRST meeting. Simulated direct WFIRST F160W image, 7.5 x 3.75 arc-minutes on a side. 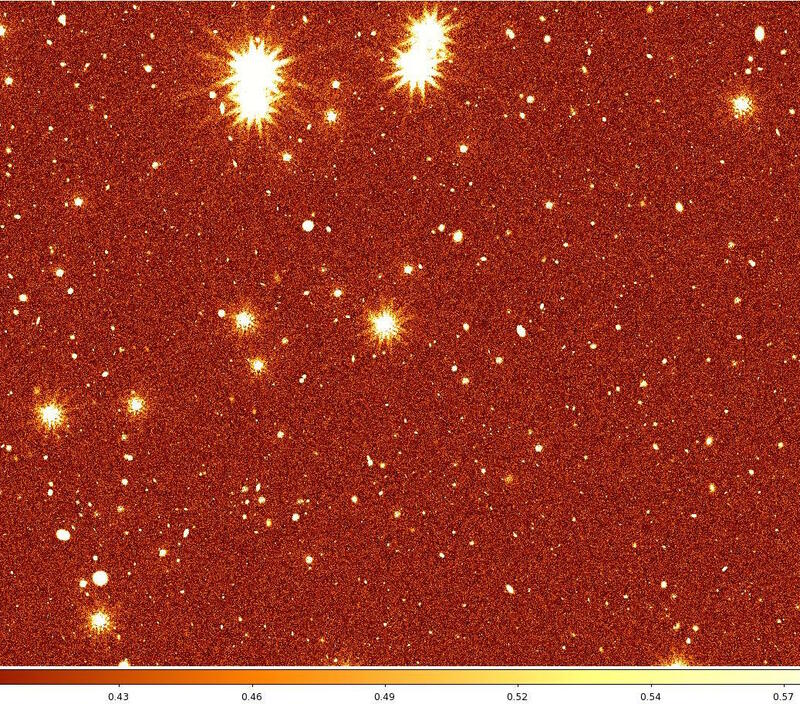 Simulated image of a sky scene at 1.6 microns (WFC3 F160W band) taking into account the observed Hα and stellar luminosity functions, the Hα equivalent width distribution, a model of stellar density in the Galaxy and background galaxy number counts. Simulated WFIRST near-IR grism image that matches the direct image with nominal dispersion. Simulated grism image of the previous direct image field with nominal (10.8Å/pixel) dispersion, covering 1 to 1.9 microns. compared to HST and JWST. 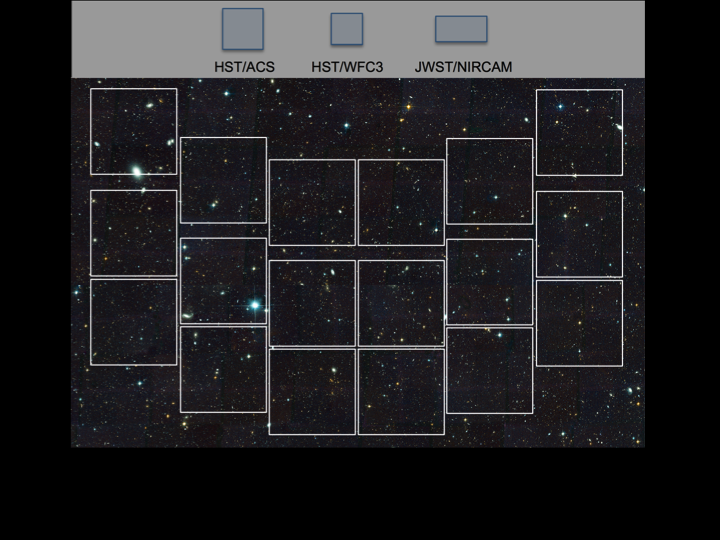 Field of view comparison, to scale, of the WFIRST wide field instrument with wide field instruments on the Hubble and James Webb Space Telescopes. Each square is a 4k x 4k HgCdTe sensor array. The field of view is 0.28 degrees2. 2015 SDT Report. Simulated WFIRST coronagraph image of 47 Ursae Majoris, showing two detected planets. Simulated WFIRST coronagraph image of the star 47 Ursae Majoris, showing two directly detected planets. Simulation parameters: 10 hr exposure time, 525-580 nm, Hybrid Lyot Coronagraph. Field of view of 1.36". 2015 SDT Report. 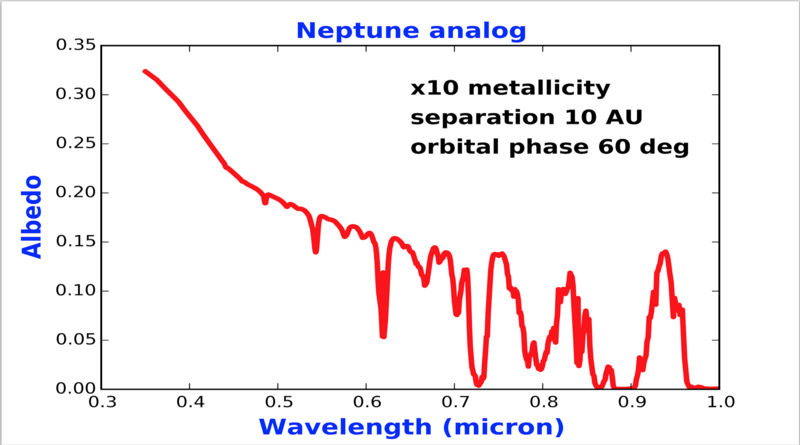 A theoretical albedo spectrum using data from the Cahoy et al. 2010 models. 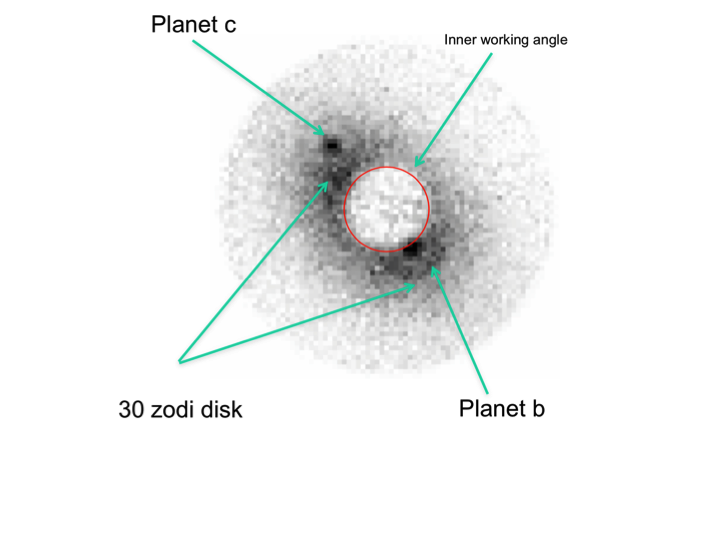 Such simulations help assess the detectability of exoplanets in reflected light by the WFIRST Coronagraph Instrument, the feasibility of discriminating exoplanets from background stars and galaxies, and exoplanet yields. 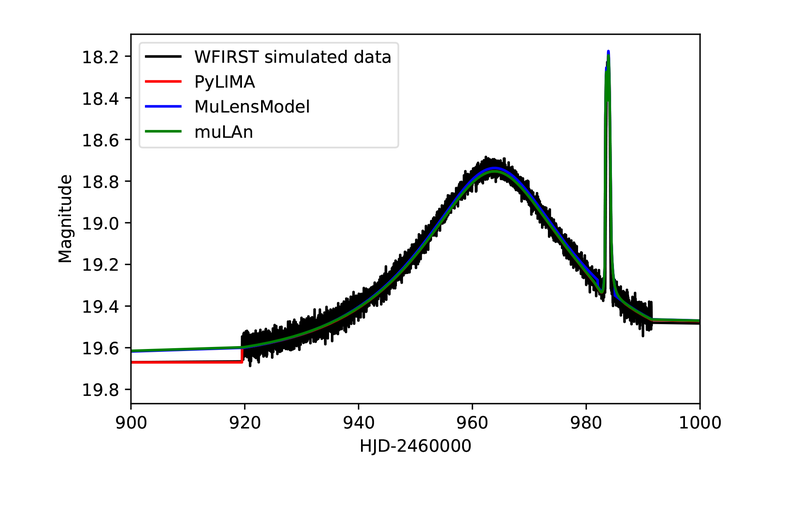 Figure shows WFIRST simulated data in black, and the best fit models generated using the pyLIMA, MuLensModel and muLAn microlensing software packages. This figure is generated at the end of the tutorial python notebook available on this site. Abstract deadline for Science in Our Own Backyard meeting. Registration deadline for Science in Our Own Backyard meeting.